Fun Facts About Dentistry: Part 1—Jewels in Your Teeth. Seriously? But dentists, and dentistry aren’t always serious. The following lighthearted series is dedicated to the FUN side of dentistry! Enjoy! If you were paying attention in school, you may have learned about the Mayans. They were the ones who predicted the end of the world. As you might have guessed by now, fortunately their prediction was incorrect. Aside for their wrong main claim to fame, another lesser-known fact about the Mayans exists. The fact is…they enjoyed a good “grill”. Now, we’re not talking about what you use to cook hot dogs and hamburgers. We mean their teeth! An article in EliteReaders shows that the Mayans would have someone use a ‘drill’ to cut out parts of their teeth and have jewels inserted to create interesting shapes or patterns. It seems that men, in particular, were interested in having gems installed in their teeth. Researchers believe that the Mayans must have been skilled at dental work because they could accomplish all of this without breaking the teeth. Wow! Interestingly enough, “grills” have made a comeback. They are now known in the hip hop community and are called “golds” or “fronts”. 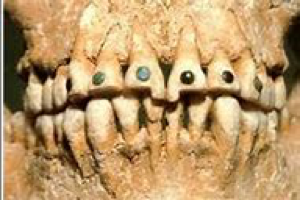 Unlike the Mayan culture, these new “grills” are worn OVER the existing teeth and not placed in the tooth. A good adjustment…don’t you think?